Discosure: This post is sponsored by Home Decorators Collection as part of the HDC Holiday Home Tour blog hop. However, all opinions are 100% my own. Hey friends! Thanks so much for stopping by today! Before we begin, I’d like to invite you to sign up for my newsletter and also follow along with me on Pinterest, Instagram, Twitter, HomeTalk and Facebook. It always makes my day to hear from my sweet readers! Y’all are the best! Can you believe that Christmas is just around the corner?! I’m still in shock that it’s just a few weeks away! It seems like it was just yesterday that I wrote last year’s post on our Christmas Entry! 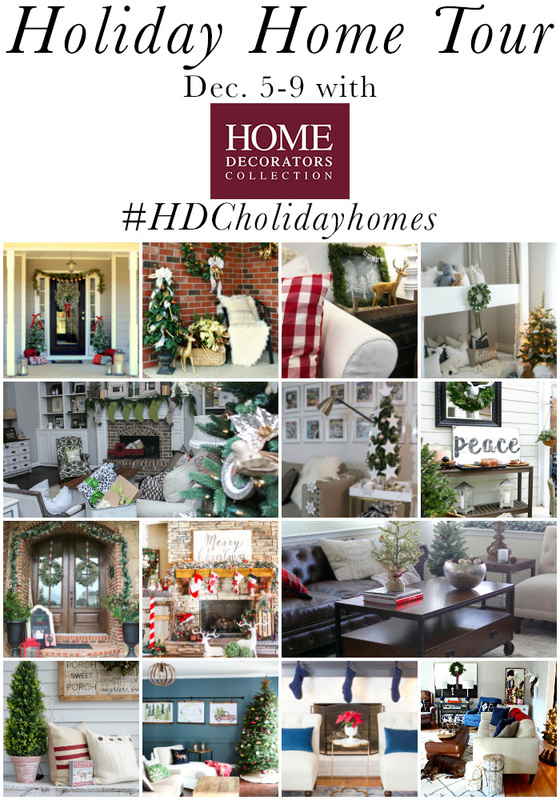 And this year, I have the privilege and honor of partnering with Home Decorators Collection® for the #HDCHolidayHomes blog hop. I have LOVED working with HDC, and I hope to do more collaborations together in the future. So, thank you, HDC, for having me. It’s been a pleasure! Throughout this week, there will be loads of gorgeous inspiration for your Christmas decorating via the #HDCHolidayHomes blog hop. Each day, new bloggers will be showing you a peak into their homes and sharing with all of you sweet readers how they decorated for Christmas. So, when you’re finished with my family’s home, be sure to start back at Day 1 (please see schedule at the bottom of this post) and check out all the other lovely homes in the #HDCHolidayHomes blog hop. Also, don’t forget to use this hashtag on all our social media platforms, so that you can follow along with us. And lastly, you will have the chance to win one of two $250 gift cards at the bottom of this post! I’m absolutely loving my new Martha Stewart Living Glistening Pine Garland! I got 3 of these 9-foot garlands, and I’m so glad I did. With the glitter and the white-tipped pinecones that are attached to the branches…plus the 100 lights that are on each garland, our mantel shines so bright! Those letters you see there on the each stocking are actually a really simple and affordable diy project! If you’d like to read the easy tutorial, please click here. I’m so excited because I was FINALLY able to talk my sweet hubby into painting our great room a gorgeous white! I just love it! This fresh look has totally brightened this space! If you’d like to see how it looked before (plus see how I put together this gallery wall on a thrifty budget), please click here. Notice how the garland sparkles! And the chalkboard below is another recent super-easy and affordable diy project. To learn about the easy steps to making this beautiful chalkboard, please click here. Another fun Christmas decor item I picked out at Home Decorators Collection® was this fun “Reindeer Treats” wall decor! It’s so versatile! And I don’t know if you noticed or not, but you see that glitter house behind my fun reindeer sign? Well, I made that glittery decor, and you can read all about it here. If you click on that link, there’s even a live tutorial video on how to make one yourself! You definitely need to check it out! You’ll see in the pic below more of my beautiful new garland! I just used some jute to attach it to the stairs every so often. It sparkles gorgeously! And that galvanized tray with the 2 trees has some polyfill for a “snowy” effect. Of course, I had to add some fun, vintage accessories on the coffee table for touches of farmhouse charm for this beautiful season. And this toy car is a favorite of mine. The classic wood paneling gets me every time. To the left of the family room is our dining room. I loved putting this rustic, woodsy-styled tablescape together! To save money, I did a couple of diy projects for our dining table and shopped our house and some thrift stores. If you’d like to find out more about our farmhouse tablescape for Christmas, please click this link. The last item I picked out from Home Decorators Collection® was one, long strand of some gorgeous micro LED string lights. The great thing about this product is that it’s on a timer, and there are lots of timer options on this one set of lights! Check it out here. If you’ll notice (in the pic above), there’s a hot chocolate bar to the left of our china hutch. It’s a tradition in our family to enjoy some yummy hot chocolate during the Christmas season almost every day. I blogged all about styling this fun station in this post here. And lastly, I shared all about our kitchen with a few touches of farmhouse charm for Christmas, which you can read about here. Well, I hope you’ve enjoyed this home tour of ours! Please be sure to stop back by this week and the next for more Christmas decor posts from our home, such as our front entry, more on our dining table, our kitchen and fun hot-chocolate bar ideas! If you have any questions, please feel free to email me at TheRusticBoxwood@gmail.com, or comment below. You can also find me on Pinterest, Instagram, Twitter, HomeTalk and Facebook. I always love to hear from y’all! And thanks again to the wonderful team at Home Decorators Collection®! I hope all of you have a very merry Christmas! Everything looks great! Especially love the mantle!! Aww, thanks so much Elaine! Merry Christmas! I am so loving the white walls!! The garland is amazing. Everything is beautiful!!!! So cozy and who doesn’t love raindeer treats? Love the sign and your warm fuzzy addition to you Christmas decor. You’re a sweetheart! Thank you, Maggie! 😉 Merry Christmas! I love your ‘lumberjack-woodsy theme’. It is so warm and cozy and you have the perfect touches incorporated into your holiday decor. Happy Holidays to you and your family. Thanks so much, Laura, for your encouragement! 😉 I hope you have a wonderful Christmas! Your home looks lovely! Love it all! Katie, everything is so beautiful and cozy! You’re so creative and know just how to put things together to make the best vignettes. Love every single thing!! First time on your blog and I’m impressed with all you do! Aww, thank you, JoAnne, for your kind words! I hope you have a merry Christmas! What’s up to every body, it’s my first go to see of this blog; this website includes awesome and really good information in support of visitors. I just want to tell you that I am all new to blogs and absolutely savored you’re page. Most likely I’m likely to bookmark your site . You really have outstanding articles. Thanks a bunch for sharing your webpage. I am really loving the theme/design of your site. Do you ever run into any browser compatibility problems? A few of my blog audience have complained about my site not operating correctly in Explorer but looks great in Safari. Do you have any ideas to help fix this issue? Greetings from Florida! I’m bored to death at work so I decided to check out your website on my iphone during lunch break. I love the info you provide here and can’t wait to take a look when I get home. I’m shocked at how fast your blog loaded on my mobile .. I’m not even using WIFI, just 3G .. Anyways, amazing blog! Do you mind if I quote a few of your articles as long as I provide credit and sources back to your blog? My blog is in the very same area of interest as yours and my visitors would really benefit from some of the information you provide here. Please let me know if this alright with you. Regards! With havin so much content do you ever run into any problems of plagorism or copyright violation? My website has a lot of exclusive content I’ve either authored myself or outsourced but it seems a lot of it is popping it up all over the internet without my agreement. Do you know any techniques to help stop content from being stolen? I’d genuinely appreciate it. Hey there would you mind letting me know which web host you’re utilizing? I’ve loaded your blog in 3 different internet browsers and I must say this blog loads a lot faster then most. Can you recommend a good web hosting provider at a reasonable price? Thanks a lot, I appreciate it! Hmm it looks like your website ate my first comment (it was extremely long) so I guess I’ll just sum it up what I wrote and say, I’m thoroughly enjoying your blog. I too am an aspiring blog blogger but I’m still new to everything. Do you have any points for first-time blog writers? I’d certainly appreciate it. Hello would you mind sharing which blog platform you’re using? I’m looking to start my own blog soon but I’m having a tough time deciding between BlogEngine/Wordpress/B2evolution and Drupal. The reason I ask is because your design and style seems different then most blogs and I’m looking for something unique. P.S Apologies for being off-topic but I had to ask!